November 15, 2011 - Boeing forecasts that airlines in the Middle East will need an estimated 2,520 airplanes worth $450 billion by 2030. The forecast comes as the region's carriers continue to surpass global air traffic and capacity growth rates. Boeing estimates that the Middle East's fleet of passenger airplanes will grow from a current fleet of 1,040 airplanes to a projected 2,710 airplanes, an increase of 160 percent. 34 percent of the projected demand will be for airplanes to replace current aircraft, while 66 percent will be part of fleet expansion plans as the region's airlines gear up for significant growth over the next two decades. "The Middle East has seen an unprecedented growth in capacity over the past 10 years and every indication points to a further, significantly large increase over the next 20 years," said Boeing Commercial Airplanes Vice President of Marketing Randy Tinseth, who presented Boeing's Current Market Outlook at the 2011 Dubai Air Show. "The region's airlines with their forward thinking approach have become a competitive force globally." Single- and twin-aisle airplanes will account for 90 percent of the Middle East's new airplane deliveries over the 20-year period, according to the Boeing forecast. An estimated 1,160 single-aisle jets, such as the Boeing 737 MAX, and 1,110 twin-aisle airplanes, such as the Boeing 777 and 787 Dreamliner, are expected to be delivered to the region during this time. The remaining ten percent is split between large airplanes such as the Boeing 747-8 Intercontinental and will account for 7 percent of projected demand, with an estimated 180 airplanes to be delivered to airlines in the Middle East. Regional jets will account for the remaining 3 percent. 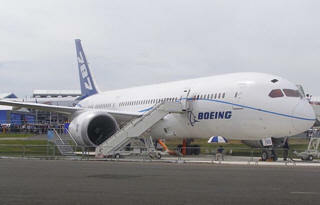 As of September 14, 2011, Boeing had a backlog of 300 airplanes in the Middle East. Customers in the region count for a large share of Boeing's twin-aisle backlog, accounting for 26 percent of 777s and 15 percent of 787s on order. Boeing currently has a total of 47 customers in the region that operate an estimated 1,200 flights per day on 425 Boeing airplanes.